Eye On Sports Media: So What If They Tailgate In A Cemetery? So What If They Tailgate In A Cemetery? Ballgame aside, the trip to Athens, Ga. was quite an experience. There is of course the pageantry of playing inside the fifth largest stadium in college football (As a side note, our seniors have now played in three of the five largest venues in college football: Michigan Stadium at U of M, Beaver Stadium at Penn State and now Sanford Stadium at UGA). Though I will take a "Central Saturday" every time, the game day atmosphere in Athens was something to see. The hilly campus was rife with tailgaters for over a mile along the bus route to the stadium. There was one scene so bizarre (and frankly a bit frightening) that offensive tackle Andrew Hartline nudged me and had me look out the window. Groups of people were tailgating in a cemetery. Welcome to SEC football. What is this? SEC bashing on the NCAA website? Wait a minute, did I say NCAA website? Yes, his blog is maintained not on the official Central Michigan web site, but on the NCAA site. Has the NCAA tried to take their control of blogs to a new level? Are they now requiring that athlete blogs be maintained on their site so they have editorial control? Or is it just something they are trying to do to drive traffic to their poorly designed site? All interesting questions just begging for an answer! And for the record, with few places to park in Athens on a game day, you tailgate where you can. And since the cemetery in question is directly across from the stadium, the fans do not have very far to crawl to watch the game after their pre-game fetes. 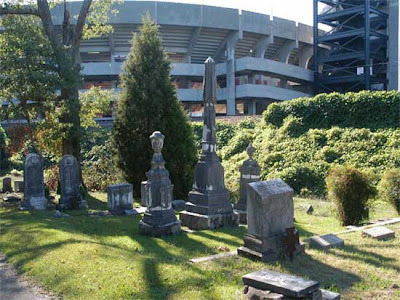 Oconee Hill Cemetery lies across the street from UGA's Sanford Stadium. Photograph Courtesy of Oconee Hill Cemetery.